This EA is working on all currency pairs. This expert works based on volatility channel indicator and it replaces your trading stop loss by means of it. By using this expert, you won't be worried about considering your open transactions as well as it is not necessary to check your transactions over and over. The expert will find stop loss points automatically via volty channel settings and it also implement it on your trades. The important tip is that this expert cannot open any positions and it only changes the stop loss of your opened transactions. In order to see the function of the expert on your trading, you can put volty channel indicator on your chart and finally execute its settings on expert. For more information regarding the function of expert, a clip has been prepared in advance, I will be greatly grateful for your caring consideration. In this clip, a bunch of transactions will be opened as a demo so that you can observe stop loss changes. But in reality, trading will be done merely by YOU. Expert ON/OFF - If true, EA is run. MA Price - Moving average price. MA Period - Moving average period. MA Mode - Moving average mode. ATR Period - ATR period. Risk Factor - The risk factor for Volty channel. 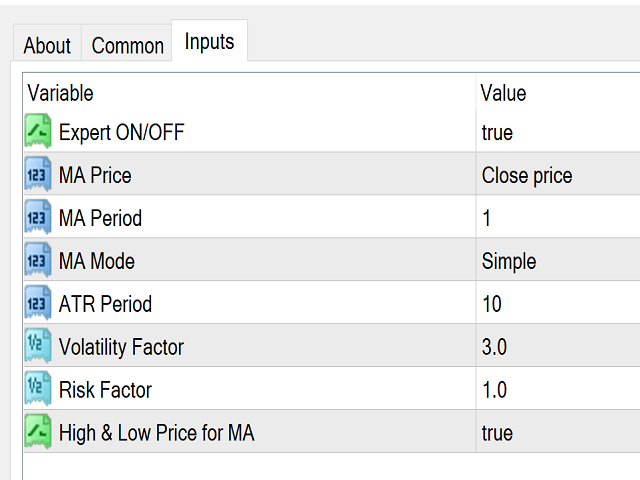 High & Low Price for MA - if true, uses high and low prices for calculate moving average.